This guy lives to guide hunts. Fred successfully guided his first hunter to a great 6x6 bull in 2004 and hasn't looked back since. His extensive knowledge of the mountain comes from numerous hours spent in the saddle riding and exploring the high country. Obsessed with his hunter’s success; be prepared to pack meat if you’re hunting with this guy. Diverse in skills and knowledge, Kendall loves to share the heart of the West Elks with his clients and inspire others to find the joy and beauty in the great outdoors, just as he does. Whether on a horseback ride, in the cook tent whipping up back country cuisine, or guiding a hunt, he cares for the interest of the clients. Kendall is an outstanding chef and connoisseur and prepares some for the best home cooked meals you'll ever eat in a wilderness camp. He's also been know to guide a hunt or two, and knows how to get it done on the mountain. 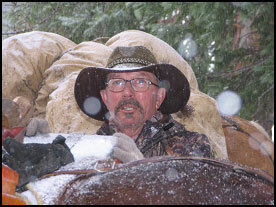 The “Old Mountain Goat” has over 20 years experience guiding in the West Elk Wilderness for Tenderfoot Outfitters. Tal has been the subject of numerous magazine articles and has appeared on several TV hunting shows. This guy is an excellent guide who knows these mountains like the back of his hand, and how to get meat on the meat pole. 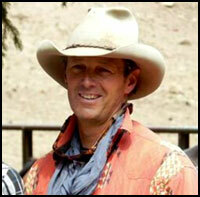 Born and raised in the Gunnison Valley, Brett's a cowboy and rancher that grew up riding in the West Elk Wilderness. Our string of mountain horses live year round on his ranch on Ohio Creek Road. He's one of the hardest hunting, nicest guys you'll ever meet, and it's a pleasure to spend time with him on the mountain. Born and raised in a hunting family right here in Gunnison, Casey has taken his passion for hunting and the outdoors to the next level and made it his profession. 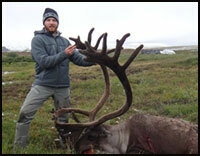 He's a licensed guide in Alaska where he guides Brown Bear and Dall Sheep hunts. 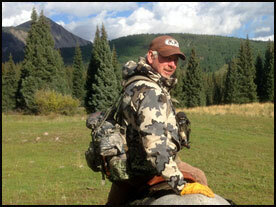 He's also guided hunts in New Zealand, and he guides elk hunts for us every fall. If you get this guy for a guide, you better be ready to hunt hard! A Colorado native, Levi lives for the challenge of the hunt, and is known for his extensive solo back country hunts in the Rocky Mountains. 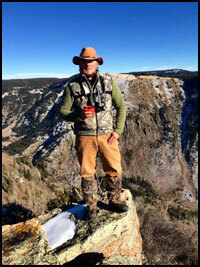 With his skills, instinct, and proven track record on finding elk you’ll understand why clients come back for more. Levi guides like he’s the hunter, so be prepared for close encounters, a lot of action, and try to stay calm when the opportunity arises. Nicknamed Jim Shockey Jr. of the West Elks, this elk killin’, bear fightin’, moose callin’ guide will definitely give you a huntin’ experience you’ll never forget. Growing up around horses in the heart of the Sierras, Shannon has spent countless hours in the saddle exploring the outdoors. Through high school she volunteered at an equine summer camp, teaching beginners how to ride, and leading outdoor activities. In 2013 she brought her passion for horses and nature to the Gunnison Valley and has been seasonally wrangling here ever since. Always up for a friendly conversation, she loves to share her enthusiasm for horses, the mountains, and all around adventure. 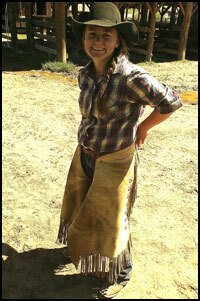 Oh, she’s also an elk packin’ machine……. 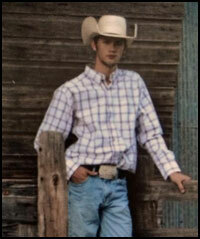 Born and raised in Oklahoma, Taten grew up with a huge passion for hunting. So, in 2015 he decided to take that passion to the next level and travelled to Swan Lake, Montana where he attended Swan Mountain Wilderness Guide School. He learned the tricks of the trade, finished at the top of his class, and now his passion is to share the excitement with others when they harvest a trophy. This little fellow started running the trails with Fred when he was eight months old and hasn't stopped since. 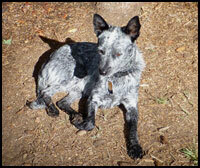 A classic Blue Heeler he came out of a shelter in Ridgeway, Colorado and is one of the luckiest dogs in the world. 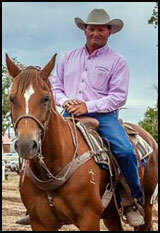 He loves to herd horses and chase any cattle out of camp that dare to trespass there. He's even been known to herd a few kids around camp in the summer. A friend to everyone and everyone's friend, he'll greet you with a handshake when he meets you. He loves to spend time in camp, and it sure wouldn't be the same without him. !